← my cell-phone works again. big deal. …….on this continent, on this planet, in this cosmos…..
understanding the meaning of the link between myself and my friend and her request that i keep her in mind…. i thought of this after discreetly dabbing the corners of my eyes upon closing the white-covered paperback and putting it in the seat-pocket in front of me, then walked to the rear of the plane to splash water on my face. i would be landing in perth, australia in fifty-eight minutes. her wondrous visits are upon me, the last one occurring at the blink of an eye a few days back. i’ve been home more than a week and was working around my livingspace, gathering the clothing i tend to drape on door-corners, cabinet knobs and chair backs for the laundry basket and potential bagging for the wash and fold. somewhere between maxx’s lounge (the daybed my dog has taken complete possession of) and the stairway to the loft where buddy was probably asleep, i blinked like we do normally, but my eyes were arrested by my missing friend, dressed in yellows and oranges, colors i never knew to associate her with before. initially in profile, she turned to me and smiled brightly. i saw her as if we were at that cafe table; the one we ever-spoke of since “meeting” almost two years ago. this all happened in a much-prolonged eye-blink – perhaps a second and a half. her smile almost shocked me to another world. for a millisecond, i wondered if i were summoned to “the eighth-electro-plasma-ocean of the ninth dimension” and between you and me, i was feeling pretty good about this possibility. this second and a half, if indeed it were this long or short a time, was enough for me to see her resplendent in joy and loving brightness. when i reopened my eyes, the moment had me where i remembered; shirts in hand, heading toward the white, hard-plastic mesh-basket lying on the floor to my right. i let go of the clothes in my hands and watched them drift down. i felt the lingering end of the charge that struck and ran through me when her eyes met mine, dissipate into the air around me. the room felt ionized, as if after a storm. this is the feeling one experiences when we go to the other place. i recall those times in my life when “such otherness” touched me. i wondered if this could have been tied to other moments and if now is then, tomorrow and always the past, the future, this moment and…. and if everything is everything in these gems of time. her words, “life loves you,” is in her eyes and her smile, in her orange and yellow and white and blueness……. this, of course, made me search the internet to see if i could find such a town, though i didn’t aggressively pursue it, but if there is one, i’m sure you’ll let me know, huh? i used the traveltime, both going and returning, to re-read salinger’s originally published works concerning the glass family. “franny and zooey,” – “raise high the room beam, carpenters and seymour, an introduction” and “nine stories,” traveled forty years and almost forty-thousand miles with me this month of march and into april. this was because of a conversation with my friend around the time of the author’s passing a year ago this past january causing the initial retrospective back then and the rediscovery of franny and zooey, dog-eared at page 39 in my record bag a year and two months later. i may have mentioned this a few notes back. i did not consider carrying mister salinger’s opus, “catcher in the rye.” it’s got a “carried-by-crazy-guy” reputation, least of all with the blooming-maniac arrival of mel gibson over the past few years. i can’t remember the movie he made with that “pretty woman” actress where he’s running around carrying that book, but he has since earned his loco-stripes, something of a tragedy in my opinion and a shame when you consider how little damage young holden caused and how much these people generated in their madnesses. which reminds me; i met a woman in sydney, australia who’s going to be in the next mad max film. it will be mel gibsonless. …..she’s done all sorts of neat stuff and as stated earlier, is currently the voice of qantas airlines – the official airline of australia and the one that john travolta shills for. say what you want about him, he knows how to fly one of those things and that’s pretty serious. …..anyway, thank you holden caulfield for mel gibson, the island continent of australia and proving once again that it’s all connected; everything, everywhere. because i’m having difficulty writing this, i’ve abandoned the notion of, “how i spent my australian vacation,” and will book-end the journey with his writings, not that there’s much in the way of profundity or wisdom to be derived from it. this is not salinger’s failing, it’s mine, but i’ll do my best to undo this. this week, the fat lady’s cancer rode with me to bellevue during the salinger-clock’s time. i had been months-late on my scheduled post-exam and the quiet little maniacs in my head were putting on their cleats and sliding into chalk-board portions of my brain where ease and anxiety would screech and collide. the young doctor was highly attentive and hugely informative about anything we spoke about. he was a fount of information about everything as we went through the battery of tests that have become so commonplace in my time there. he asked me questions and offered answers to my answers. it was the slightest bit disconcerting but was so well-meant, i was pleased to listen. when he began to prepare me for “the camera,” a thin, optical wire that’s inserted down your throat by way of your nostril, as always, i suggest to him (as i do to every doctor who performs this on me) that he uses the left nostril for entrance, as my thrice-broken nose has left me a septum of utmost deviation. armed (or “nosed”) with this information, he explained how a minor surgery, probably not more than an hour in duration, could correct this disorder. he verbally drew me the plan and execution of this surgery and i do not deny getting the slightest bit weak-kneed at this graphic presentation. i’ve had shattered bits of my skull picked out of my gray-matter with a tweezer but a nose job floors me. go figure. i thought first of my sweet friend because it started for her some years earlier with a vocal chord issue. i felt my present situation had more to do with the cold and sore throat i gave myself when i loaded up a container with trash and demolition, a zen exercise, a week earlier. he returned with the doctor who was the department head when i was diagnosed about four years ago. he was part of the “cancer board” that made the recommendations regarding my case and the direction forward. he remembered me because he saw pictures of the coffeehouse at that time. he found me entertaining and told the young intern this. we exchanged niceties and he asked me a series of questions, then looked at the information gathered in this exam. he explained to the young doctor that he might look too far into things at times…. i looked to the younger man and saw a slight bit of hurt in his face and i felt badly. i knew how well meant his efforts were. i remembered conversations with my friend who told me how a doctor dismissed her sore-throat complaints as hypochondria. i always looked at that as the start of her problems. i’m sure my friend agrees with me. 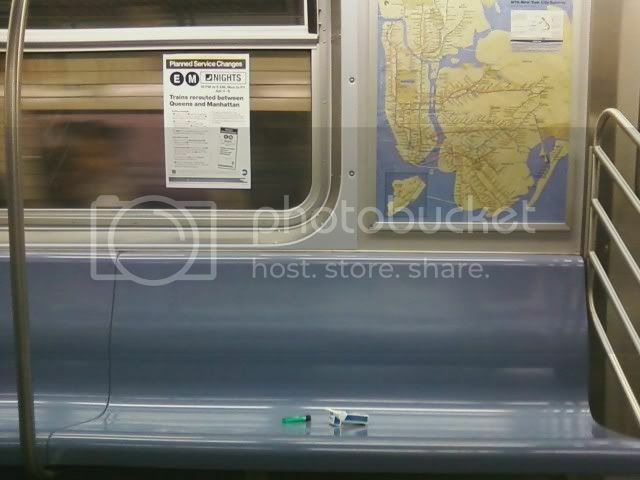 later that day, i rode the subway from brooklyn to manhattan across from a pack of smokes, my old “brand,” and a green bic lighter. i watched the entire train car fill up, but not until i was getting off the train at 34th street would people sit next to them. i watched furtive eyes spy them from all directions. and when i was riding and learning the sydney subway system, i carried salinger’s “nine stories,” learning about boo boo’s kid and waker’s army time and how senseless life and death can be…..
and how much luck, good and bad, hangs in the air like humidity on a sultry, savannah afternoon.